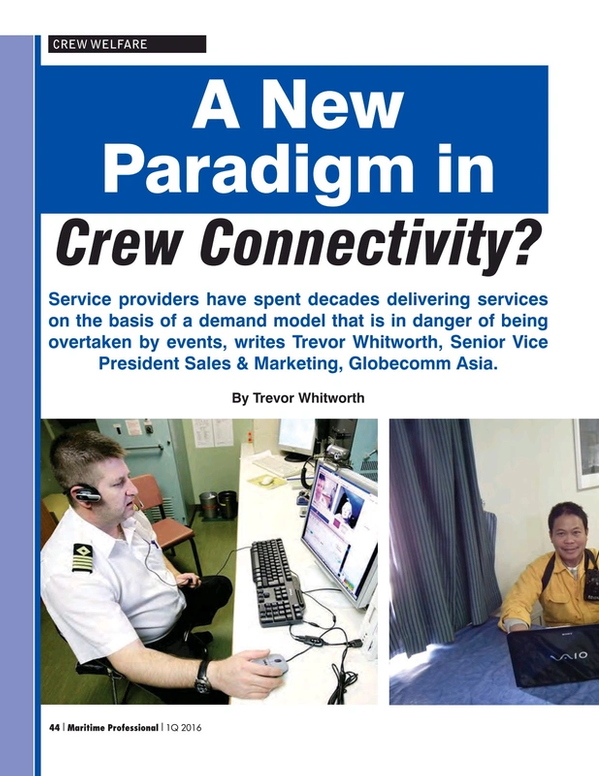 Despite some recent suggestions to the contrary, demand for crew connectivity remains a strong driver of the maritime communications market. The Maritime Labor Convention is among the factors encouraging service upgrades and higher spending, but there are other fundamental forces at work and across our industry. Shipowners and operators, managers and crewing agents need to understand what is happening and how to manage this change in a positive way. The economics of maritime communications are evolving very fast. Solutions providers are seeing this first hand and adapting to the landscape in order to meet new demands. The phone in our pocket and the tablet in our bag or on our desk means we approach communications in a new way. It’s an exciting change, one that brings the potential for much better quality of experience, higher mobility and more flexibility. Despite the challenges of communicating at sea, the demand for access via multiple mobile devices is no different than it is on land. For communications providers, it means some of the traditional ways of approaching contracts will change. In some cases, that’s already happened. For shipowners, managers and crew, expectations of greater availability are not necessarily dependent on higher costs or faster bandwidth. Even so, their expectations come with some unintended consequences. The background to crew communications has been a slow and steady evolution. From expensive and inconvenient phone calls to scratch cards for crew phones to access via internet cafes, we have seen increasing demand and usage of voice and data. The next stages moved faster – from limited web browsing to chat, messaging and social media tools which are usually the same as those we are used to on land. As interest increased thanks to the spread of landside internet access, suppliers have found increasingly innovative ways of squeezing the maximum connectivity out of the minimum bandwidth. At the same time, user packages are moving away almost entirely from a pay as you go model to fixed price bundles that only penalize you if you exceed your data limit. When the first HTS services become available, availability will increase again as new satellites dramatically step up in the bandwidth available to users. There is a lot of interest around HTS – not least because of the large amounts of money invested in it. Some observers are already talking of a bubble, in which a huge amount of potential supply searches for a market that may not be ready or willing to pay for it. And it does seem likely that prices will be higher, at least initially, leading many to question how much take up that truly can be expected by shipping. MLC 2006 does not specifically mandate crew communications – though it does specify some of the conditions under which crew should be allowed access. Even so, too many crews are still underserved and MLC provides a convenient tool for them to argue for better access – and for providers to deliver connectivity in a way that works for owner and employee alike. What MLC has achieved is to raise the profile of the debate about what could and should be available. Beyond this, MLC infers that crew welfare is central to a safe and profitable organization. Today, crews are becoming much more demanding about their need for access. Only two years ago, most GlobeComm customers were subscribing to low volume 50MB data plans. Today many are opting for four or eight gigabyte plans, even though their business requirements have hardly changed in that time, which is a reflection of increasing demand from seafarers. The fact that many owners are adding to their OpEx in what for many is a dire market further amplifies that metric, and underscores the need to recruit and retain quality crews. At the same time, these growing expectations have to be managed. Where cost used to be the defining factor, access is now the most critical. Mariners want to communicate and they are increasingly creative in the ways that they do it. A recent survey by Futurenautics for satellite operator Intelsat found that access to connectivity is a key determinant for the vast majority of seafarers when choosing which company to work for. The trend towards ‘Bring Your Own Device’ is becoming the defining feature of crew communications. Now that gaining access to connectivity is becoming easier, the next most important factor is privacy. This has real impact for solutions providers and employers alike. Facebook, for example, introduces even more demand. Consider that 1.4 billion people use Facebook every day and there are 1.5 million seafarers. It only makes sense that this traffic is rising. The trouble is, we are not in the Facebook market. There has always been very little enthusiasm on the part of owners to invest money at a scale necessary to meet seafarer demand. It’s simple economics and until the ‘disruptive innovators’ find a way to provide connectivity for free or very cheaply, the economics appear to be stacked against, plentiful, low cost, high bandwidth communications for crews. Or so you might have thought. It is no longer just about the cost per megabyte or the monthly cost of communications. The bigger question to ask is whether the market is being overtaken by events. The connectivity that crew require is arguably no more similar to what it was three to five years ago than what it was 20 years ago. All that time, providers have been working towards delivering expensive, asset heavy services and trying to make them into solutions that best fit the need. We do this by applying the squeeze to systems and circuits that are already designed for a low bandwidth environment to extract the maximum service for the lowest cost. Things have changed. It was never the case that one size fitted all – these days it doesn’t even get anywhere close. The advent of cheap smart phones, cheaper tablets and the incredible growth in the use of apps means that users are increasingly swapping ‘internet browsing’ in the traditional sense in favor of using personal devices to access apps, services, shopping, chat, voice over IP, games and content. And we are doing this on our own devices. All we require is the router and Wi-Fi signal. That crews are increasingly using apps like Viber, What’s App and WeChat and are happy to use their devices to chat, message and surf. And there is a happy coincidence in play here. We are seeing more and higher quality connectivity becoming available, often at more affordable prices. At same time, ‘App Culture’ is delivering the desired level of functionality to end users without need for huge amounts of bandwidth. For satellite operators, that may not be all good news. Even for solutions providers, it demands even more creative solutions and services. But for ship and crew managers, there is a clear dividend. You can provide the connectivity that your crew want and can do this perhaps at lower cost than you previously thought. Seagoing crew’s lives can be more connected. That said; as crew have increasingly embraced social media apps, the use of these options can be unsuitable for use over satellite. Such apps can be inefficient consumers of bandwidth because they are designed for land-based networks. As a result, GlobeComm (for example) has designed and developed our own and I’m sure we won’t be the last. Just as with the spread of the internet ashore, this connectivity is not going to stand still. We are caught in a demand-driven cycle where even the ‘new rules’ like Moore’s Law will soon be overtaken and desire for connectivity will continue to grow. Shipowners and managers also need to be aware of what will change when bringing this new connectivity on board. From across the generational divide, it is easy to criticize young people who spend more time looking at screens than they do conversing, but that is the reality. First-hand experience with crews shows that the on board culture varies from ship to ship. Some vessels are very much team-based, with social interaction strongly encouraged, others are not, even when crewmembers are of the same nationality. The risk is that by enabling crews to enjoy the same mobile access to the internet as that enjoyed on land, we also increase the isolation that many experience by encouraging them to spend more time interacting with their devices than with other people. Young seafarers want to do both – they want contact with home but they also want to learn – they want to speak and listen to their peers and colleagues. In an industry already under pressure from growing regulation, increased paperwork and procedures, the need is for greater interaction and better mentoring. Still another more controversial topic is whether, having enabled all this access to your crew’s devices, there is actually an argument for restricting it too. Owners must decide what their priorities are, what they will pay for and what crew must budget for themselves. There are safety factors: The need to make sure crew get their mandated hours of rest already has some owners restricting time online so that crew can balance internet access with sleep and other non-work activity. Add to this more existential threats – radicalization and cyber security, for example – and some ask whether the shipowner has the right to know what websites his crew are visiting, who they are emailing and what the content of those emails is. As crew become more and more connected, is there a need to draw a line between the right to privacy and the need for monitoring and perhaps control of access? Too few owners give their crew any kind of cyber security training before enabling internet access but this, together with clear IT and usage policies, are essential. Solving these problems is the next big challenge for service providers and shipowners alike. Perhaps though, the industry will provide an answer of its own. Just as we manage the transition from web surfing and email to social media, there is another wealth of content around the corner – news, sport, movies and other entertainment – all of which the providers are all too keen to sell to crews. How much take up there is of services of this sort remains to be seen, but the bottom line remains that even if the customer is not always right, he is still king. There is no point in network operators and solutions providers developing new products and services if these are not the ones being asked for. Providers need to listen much more carefully to what seafarers and operators are asking for – and to provide it in the most efficient and cost effective way. Without a doubt, the social media revolution should have taught us to listen to and anticipate the needs of users and not to imagine that solutions providers always know what is best. Change is already happening around us and the speed of change will only continue to increase. When challenged to be creative, we must be prepared to respond and address these new demands, not just with new services, but with new approaches and a mindset that reflects the new paradigm of crew communications.